An Ottawa bus driver caught on video helping commuters following the city's first major winter storm is being recognized for his kind gesture. An Ottawa resident captured the video on Tuesday as she was waiting for her bus. "It was something that I don't see every day," Adriesca Julot told CTVNews.ca in a telephone interview from Ottawa on Wednesday. "It was very heartwarming." 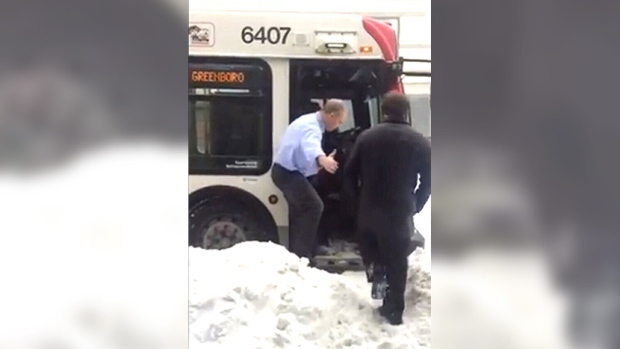 In the video, the coatless driver disembarks from the vehicle and offers a hand to every commuter boarding the bus. Julot posted the video to her Facebook page on Tuesday where she wrote that the driver's kind gesture had restored her faith in humanity. As of Wednesday afternoon, the video has been viewed more than 400,000 times and shared more than 11,000 times. OC Transpo has since announced that the driver, who has yet to be publically identified, will receive an official commendation. @Ami02 Hello, we've identified him and he'll be receiving an official commendation! Julot said commuters were already facing long delays on Tuesday after the first winter storm of the season dropped more than 20 centimetres of snow on the city. When she first noticed the driver come off the bus, she thought he would help an elderly woman who was first in line to board. But she was surprised when he helped each passenger waiting at the Rideau Street stop. Julot said she wishes she had started filming the video sooner, but admits she was taken aback by the driver's kindness. "I was so stuck in the moment," she said. The 18-year-old said she's astonishedby the feedback she's received from the video, but notes, "all the credit" should go to the driver. "He's an inspiration," she said.